The flex grooves on the outsole of the Nike KD Trey 5 IV may have worked because a good number of wearers love using the shoe for outdoor plays. Several users commend the shoe for its short break-in time. The plastic wing on the heel counter of the shoe is loved by many buyers because it gives good ankle support. It works just like the heel counter of the 11th Jordan CP3. A huge number of purchasers agree that the KD Trey 5 IV is made of durable materials. The shoe remains pristine and sturdy after months of use. A good number of reviewers say that because of the durability of the outsole rubber, the shoe model is now part of their outdoor rotation. Some buyers appreciate the outrigger in the midsole of the shoe. Just like the one on the recently released Under Armour HOVR Havoc, It has helped them avoid ankle rolls during playing. The mesh in the upper of the shoe model is a little stiff, say a few users. A handful of wearers claim that the shoe runs narrow. A small number of buyers leave comments that the shoe does not have enough space for the toes. The Nike KD Trey 5 IV is a certified outdoor performance shoe. The materials used are lightweight, durable, and guaranteed to last more than one season of games. The design is not bulky either; this looks good for casual use, too. If you are a big fan of Kevin Durant but you prefer budget-friendly basketball pairs, look no further. The Nike KD Trey 5 IV will give you the support and comfort that you are asking for. For me personally, I'm gonna end up keeping these and they're gonna be my go-to outdoor hoop shoes. Fairly comfortable, great traction, decent cushion, great support and a basic upper. 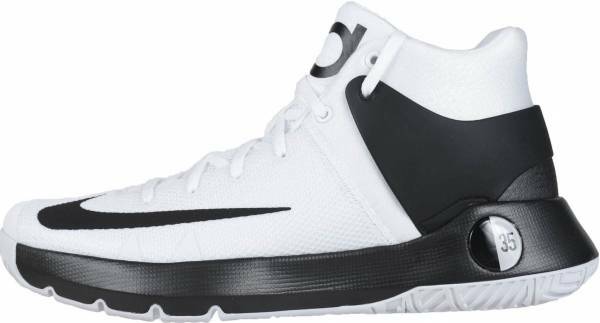 The Nike KD Trey 5 IV is a mid-top shoe with a mesh upper.The shoe model has Zoom technology in the forefoot area and plush Phylon in the midsole. The outsole has a sturdy rubber with herringbone traction pattern. These basketball sneakers from the Swoosh have a plastic wing to provide additional support to the foot aside from the existing heel counter. Cushion. The Nike KD Trey 5 IV has Zoom and Phylon in the midsole. The Zoom units are located in the forefoot area. They are lightweight cushioning units that absorb impact and protect the knees. Phylon is also a lightweight and responsive EVA foam. Both work together to provide a great experience to the athlete. Traction. The KD Trey 5 IV has herringbone pattern as traction. The outsole rubber is of above-average thickness. The deep flex grooves make the shoe model perform beastly on outdoor courts. For indoor courts, wiping would be necessary as the outsole attracts dust. Length and Width. Like other KD shoe models, the KD Trey 5 IV reportedly runs narrow. People with normal-sized feet can go true to size. Users with wider feet can either go up half a size or go true to size and adjust the shoe laces upon wearing. Lockdown. The Nike KD Trey 5 IV has flat shoelaces that can be tightened to achieve the desired snugness. The tongue is heavily padded such that when the shoelaces are tied tightly, it will not bite on the ankle. As for the plastic wing on the heel counter, it provides good support to the foot. It hugs the ankle well and effectively secures the foot. The upper of the Nike KD Trey 5 IV is made of mesh that has fuse overlays. The rear panel is consists of a plastic wing and a padded nylon textile. The mesh keeps steady the airflow for the foot. The fuse overlays provides durability to the mesh. The foam on the rear panel keeps the ankle comfortable and supported. The midsole has an outrigger that helps prevent ankle roll injuries. The Nike KD Trey 5 IV comes in different colorways. This mid-top shoe has a simple and presentable design that is good for both on-court and casual use. To signify that this shoe is part of Kevin Durant’s signature line, his famous logo is marked on the tongue and outsole. His jersey number is located on the lateral side of the shoe. As for the Nike Swoosh, it is printed on the forefoot and lateral side of the shoe. To showcase the technology used in the midsole, a NIKE ZOOM callout is embossed on the lateral side. These Kevin Durant basketball shoes also have some special colorways. The subsections below discuss a few of them. To promote breast cancer awareness, the Think Pink colorway has a Kay Yow theme in the upper, black KD logo and Swoosh, and white midsole and outsole.